If you are looking for information on the Best Coupon Book franchise business opportunity, Best Coupon Book franchises or Best Coupon Book franchising, then you have come to the right place. Best Coupon Book is a unique turnkey, home-based business that you can have up and running in no time. With a Best Coupon Book franchise there's no hiring a staff of employees, no finding a storefront, and no coming up with a huge initial investment. Plus, we offer a comprehensive training program in addition to ongoing day-to-day support. Best Coupon Book is recognized as a leader in the $52 billion dollar strong direct marketing and advertising industry. 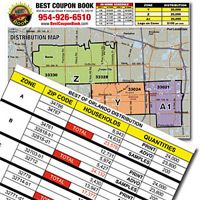 For more than ten years, we have been offering our unique marketing and advertising opportunity for local businesses through monthly mail coupon booklets directed at households within an established, exclusive territory. Our track record of success includes an 80% customer retention and repeat advertising rate that is second to none. And the best part is all the design, printing and mailing are done for you! No previous experience is necessary; just your willingness to reach out to business owners and show them the benefits of this remarkable opportunity. As a turnkey, home-based business, a Best Coupon Book franchise can be started with a reasonable, low initial investment and provide a very attractive earnings potential that you can ramp up quickly and without complication. We do not charge royalty fees and our enthusiastic, highly skilled corporate office staff is there to assist you every step of the way. Recurring monthly revenue, year after year! Many franchise opportunities require the need to spend valuable time up front laying the groundwork for your business. This is not the case with a Best Coupon Book franchise because there's no location scouting, build out management, hiring of employees, or waiting for inventory or equipment. All you need is a telephone, an appointment book, a high speed internet connection and the ability to interact with business owners. "This is for anyone who is looking to own their own low cost business with great returns. Financially, we started turning a profit the 2nd month. Best Coupon Book has given us the freedom and lifestyle we always desired. We highly recommend this proven system." Best Coupon Book founder, John Foret, is committed to a rigorous training process to give each franchisee the best springboard for success. Initial training occurs at our corporate headquarters which allows franchisees to share questions, ideas and solutions anytime with key team members. Our annual Best Coupon Book conference also gives owners a chance to strategize directly with staff and other franchisees who share a similar passion and vision for their business. Starting a business of your own is an important decision that will affect you and your family for many years to come. We appreciate the importance of this decision and we encourage you to weigh all of your options carefully. Our corporate staff is committed to helping you get all the information you need as you evaluate a Best Coupon Book franchise and determine whether it's the right match for you.